Does anyone know what size French flags were during the SYW? This little lot were in a small bundle of oddments that I bought on Ebay. Each side measures about 40mm so that would be about 2.25 metres if they are 1:56 scale. My guess is that they may be for 40mm figures. Ta, Now I'm wondering if it was the dice gods telling be to do a new scale. Mind you these would look impressive on 28mm. Other examples are quoted at 210x180cm, 210x227cm and 204x220cm. And in 1721 infantry flags were described as 7 feet square on a staff of 11.5 feet. That'll do, suppose I need an army soon. EBs flags are at least 40mm, and they look great. Kronoskaf says they were bigger at the start of the 18th century, but most regiments standardised at 162cm square in 1725. Of course, a SYW French army is VERY pretty and would look fabulous with large flags! Much better than the dull prussian ones, how anyone could paint flag after dull flag of fritz. This is the path to insanity. 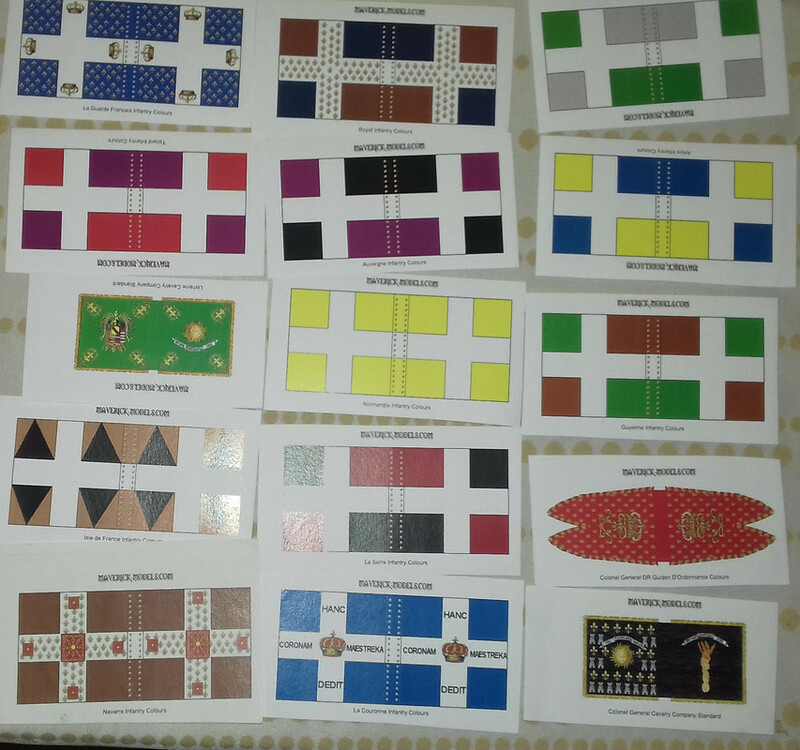 12 infantry flags, even using small battalions I won't see change out of £300 for troops, plus horse & guns. A £500-600 project triggered by part of a job lot that cost me £4.60.